Anatoly Karpov (born May 23, 1951), is a Russian Grandmaster and former World Champion. He reigned for two terms, 1975-85 and 1993-99. He won over 160 top-level tournaments and also set new longevity records at #1. He brought the standard of chess to new heights. His game drew criticism from former champion Mikhail Botvinnik when Karpov first attended his school as a 12 year old boy. Botvinnik reckoned that Karpov had no chance of a successful chess career. To hear that from someone like Botvinnik would be enough to crush most people. But in the sort of character that would come to define him, Karpov showed grit, taking Botvinnik's words on the chin. He used them as a spur to drive him on. Through sheer hard work, he became the ultimate positional expert and one of the greatest ever. It was a testament to Karpov's tenacity and unwavering determination that he would go on to replace Bobby Fischer as World Champion. Karpov was born on May 23, 1951 in Zlatoust, Russia. He was from the Ural Mountains. Young Anatoly played chess from the age of four. His earliest successes came quickly and he rose to the rank of Candidate Master by the age of 11. When he won a place in Mikhail Botvinnik's chess school things were looking up. But he got a reality check with Botvinnik's early evaluation: "The boy does not have a clue about chess, and there's no future at all for him in this profession". Instead of crumbling in the face of such damning criticism he fronted up, took all of the material that Botvinnik handed him and studied hard. He would eventually become the best player in the world. Karpov acknowledged that although he was talented he still needed to put in the hours. His knowledge and understanding of chess theory was by his own admission significantly lacking. 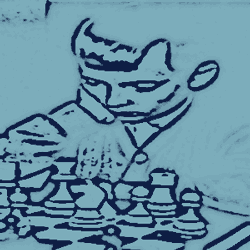 He studied chess books like a demon until positional awareness was becoming like second nature to him. His natural chess instinct was now being backed up by a deep reservoir of theoretical knowledge. Karpov's positional play improved dramatically. So much so that this former weakness became his greatest strength. When he was 15 he equaled Boris Spassky's record as the youngest ever Soviet Master. Karpov's first appearance in international competition was in Trinec, Czech Republic in 1966. He won the tournament. He followed that up by capturing the European Junior Championship in Groningen, Holland in 1967. Karpov moved to Leningrad to work with GM Semyon Furman in 1968. He later named Furman as the main driving force behind his development as a world class chess player. In 1969 he won the World Junior Chess Championship in Stockholm, winning 9 and drawing 2 of his 11 games. He became a GM, aged 19, in 1970 when he took fourth place in a strong international field in Caracas, Venezuela. His first major achievement at senior level came in 1971 when he won the Alekhine Memorial in Moscow ahead of the heavyweights of world chess. Karpov had arrived. In 1973 Karpov and Viktor Korchnoi shared second in the USSR Championship behind Boris Spassky. He and Korchnoi shared first place at the Leningrad Interzonal Tournament later that year. This qualified him to compete in the 1974 Candidates Matches for the right to play Bobby Fischer for the World Championship. He beat Lev Polugaevsky 3-0 with 5 draws in the quarter-finals. Karpov then found himself playing the former World Champion Boris Spassky in the semi-finals. Spassky was the favorite to win but after a slow start Karpov pulled through winning 4-1 with 6 draws. He played Korchnoi in the final in Moscow. He won a tense match 3-2 with no less than 19 draws. He was clear to play the champion Fischer the following year. Fischer sent a telegram to FIDE outlining three non-negotiable proposals for the match against Karpov. Firstly, the winner would be the first one to reach 10 wins, draws would not count. Secondly, there would be no limit to the number of games played. They would simply continue playing until one of them reached 10 wins. Finally, in the event of the score going to 9-9, the match would be declared a draw, the match stakes would be split evenly and Fischer would remain the champion. FIDE accepted the first proposal but rejected the remaining two. In response Fischer sent another telegram informing FIDE that in rejecting his conditions they had effectively ruled him out of the World Championship of 1975. In the same message he formally resigned his tenure as FIDE World Chess Champion. Without a victory over Fischer, Karpov was none the less installed as the new FIDE World Chess Champion. Conscious that his crown did not arrive in the orthodox fashion, he set out to prove his legitimacy as the title holder. He took part in every major tournament over the following decade, achieving an astonishing record. Fischer had dropped out of world chess and no one else could handle Karpov. Indeed Fischer would probably have had to give way in the end anyway. Karpov won in Milan in 1975 and the first of his 3 USSR titles in 1976. He set a then record of 9 consecutive 1st place finishes around this time. He left the chess world in no doubt as to who reigned supreme. Viktor Korchnoi emerged from the 1977 Candidate Tournament to challenge Karpov for the title in 1978. The match was staged in Baguio, Philippines. The winner would be the first to win six games. It was even early on with the first seven games ending in draws. Karpov landed the first blow in Game 8 and led 5-2 after 27 games. Korchnoi staged a late rally to equalize but Karpov edged it 6-5, with 21 draws to retain the title. In 1981, Korchnoi was again the challenger and faced Karpov in Meran, Italy. Unlike the previous encounter, this one would not go down to the wire. Karpov won 6-2 with 10 draws in what became known as the Massacre in Meran. It would be Korchnoi's last tilt at the title. Karpov was now the undisputed kingpin. But inevitably a new challenger always appears on the horizon to upset the world order. In Karpov's case it would be Garry Kasparov from Baku, Azerbaijan. It would be the defining rivalry of Karpov's career. They would fight for the title a staggering five times. The first one took place in 1984 on the same format as the matches with Korchnoi, first to six wins. Karpov built up a seemingly unassailable 4-0 lead after 9 games and later even led 5-0, apparently destined for an easy defense. But Kasparov fought hard and brought it back to 5-3 mixed in with 40 draws!. Karpov couldn't close out the match. A rematch was set for the Autumn of 1985. FIDE returned to the old 24 game format to avoid a repeat of the Marathon Match. Kasparov won a close encounter in '85, clinching the win in the last game, 5-3 with 16 draws. He had three further successful World Championship defenses against Karpov. 5-4, 15 draws in London (1986). 4-4, 16 draws in Seville (as champion, Kasparov retained the title) (1987). 4-3, 17 draws in New York and Lyon (1990). Kasparov held the FIDE World Championship until 1993 when he broke away from the organization following a dispute. He set up a rival organization and FIDE organized a World Championship for their vacant title. Karpov and Timman were the top contenders in the FIDE organization when Kasparov and Short left. They played for the championship in 1993. Karpov won the match 6-2 with 13 draws. In 1996 he retained the title beating Gata Kamsky 6-3 with 9 draws. 1998 saw him defeat Vishy Anand 2-2 with 2 draws followed by a rapid tie break 2-0 win. The 1998 World Championship was the first to use a short match format. It was a tournament involving the world's strongest players. Karpov as champion was seeded straight through to the final. FIDE introduced another change for subsequent World Championships that meant that reigning World Champions would have to compete in the tournament along with everyone else. For the first time the champion would have to qualify to play in the final. Karpov disagreed with this new departure and refused to participate in protest. Anand did not take part either and Kasparov was also still absent. Alexander Khalifman won the tournament to become FIDE World Champion. Let us say the game may be continued in two ways: one of them is a beautiful tactical blow that gives rise to variations that don't yield to precise calculation; the other is clear positional pressure that leads to an endgame with microscopic chances of victory.... I would choose the latter without thinking twice. If the opponent offers keen play I don't object; but in such cases I get less satisfaction, even if I win, than from a game conducted according to all the rules of strategy with its ruthless logic. Anatoly Karpov raised the bar at the highest level of world chess. He was the first in a long line of chess professionals. Professionalism not just in terms of gaining monetary rewards for his exploits, but in the sheer dedication he devoted to chess. He spent his life studying the game as a science. After Karpov, all future champions who would climb the mountain to reach the summit of world chess would need more than merely a remarkable aptitude for chess. They could only hope to succeed by absorbing an ocean of chess theory. This would serve as a necessary underlay to natural instinct and talent fostered by experience gained in the bear-pit of international competition. The first of this new breed of chess player molded by the environment that Karpov helped to form would be the one to depose him as champion. That player was Garry Kasparov. This link takes you from Anatoly Karpov back to your Homepage. Your Homepage is where you get a site overview. There you can see all of the resources on offer in this web site.